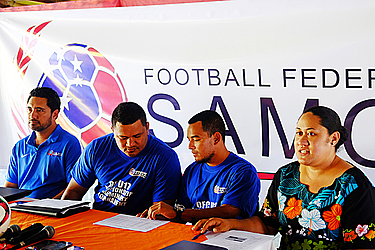 On Saturday, Samoa’s Football Federation will show their ability of being a host for an international tournament. The Oceanic Football Confederation Preliminary will be hold on three different match days, with the first one being held on Saturday, 2nd of July. The tournament will start with matches between hosting team Samoa and American Samoa and Tonga and Cook Islands. For the Football Federation Samoa, the arrangement of a tournament of this dimension is indeed not the first of its kind, as the organization’s media officer Angela Lafaiali- Pauga explained. “We’re very pleased to announce our team and to have the opportunity to host an international event like the OFC U-17 Preliminary 2016 and we also like to thank all four member associations which will participate in the tournament”. As the media officer stated, the Preliminary’s winner will “progress to the U-17 championship, which will be held in Tahiti in 2017”. The Federation also announced the actual team squad which will represent Samoa in the upcoming tourney. The newly established squad had to overcome some difficulties regarding the ideal arrangement of the training times. “In the previous years, we were able to run our programme smoothly, but since last year, there certainly have appeared some difficulties we have to face, because of the changed times for school finishing. We didn’t have as much time as usual to prepare our trainings”, said Martin Tamasese, the Samoan Team’s Technical Director. Nonetheless the team staff could ensure that the team will give their best in order to achieve an appropriate place in the competition’s end result: “We’ve been using every opportunity to train the team during Saturdays and the National League. We’ve also trained every possible day after school with the team”. Desmond Faaiuaso, the team’s head coach, stayed positive regarding his expectations for the tournament. “Everyone expects us to win this tournament. And we all share this expectation, because our main goal is to win and move the team to the next level”, he concluded. Eti Fatu, Kitiona Nauer, Sefa Mamea-Hind, Stanley Mamea, Osa Savelio, Willie Sauiluma, Jackson Nautu, Lotial Mano, Jeneum Kepu, Dilo Tumua, Julius Duffy, Richard Epa, Falaniko Nanumea, Paul Felisi, Jefferson Faamatau, Jeffrey Leiataua, Solomona Levi, AJ Amoso, Talita Hafoka. Desmond Faaiuaso (Head Coach), Sauni Asiata (Team Manager), Ricky Slade (Assistant Coach), Aaron Kapisi (Assistant Manager), Masato Tsuchiyu (Technical Advisor).